Chicago, IL—The Musée du Louvre, the High Museum of Art, Crystal Bridges Museum of American Art, and the Terra Foundation for American Art have announced the final installation in their four-year collaboration focusing on the history of American art. 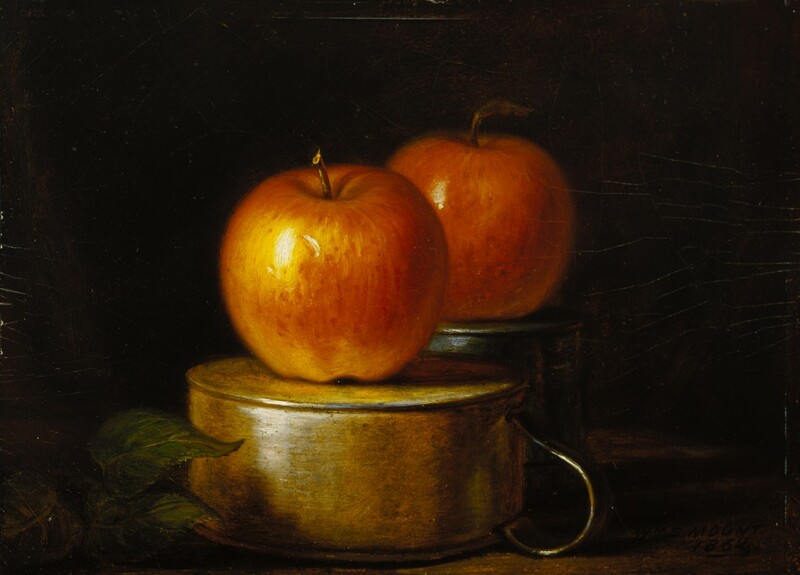 Opening at the Louvre on Feb. 5, 2015, American Encounters: The Simple Pleasures of Still Life explores how late eighteenth- and early nineteenth-century American artists adapted European still-life tradition to American taste, character, and experience. The culminating presentation of the American Encounters series—which has aimed to broaden appreciation for and dialogue about American art both within the U.S. and abroad—The Simple Pleasures of Still Life follows previous installations examining important genres in American art, including portraiture, landscape and genre paintings. Following the installation at the Louvre (Feb. 5–April 27, 2015), The Simple Pleasures of Still Life will travel to Crystal Bridges Museum of American Art in Bentonville, Ark. (May 16–Sept. 14, 2015), and the High Museum of Art in Atlanta, Ga. (Sept. 26, 2015–Jan. 31, 2016). Though a centuries-old tradition in Europe, still-life painting was slow to take hold in the U.S., increasing in popularity over the course of the 19th century, an era of remarkable political, economic and social transformation. The subjects depicted in American still lifes evolved throughout these decades, drawing on and expanding the traditions of Dutch-style tabletops laden with fruits and vegetables and ornate French bouquet arrangements in the selection, arrangement and depiction of objects imbued with New World symbolism. As the country became more cosmopolitan, a result of its growing industrial and economic power, art patronage in the Gilded Age increasingly focused on the representation of wealth in pictures of exotic objects popular among the upper classes. The subjects of still-life painting during this period served as evocative emblems—whether of regional identity, moral values or eclectic collecting—and reflect the story of an evolving nation. The ten masterpieces in the The Simple Pleasures of Still Life speak to the diversity of the still-life genre in the U.S. and range from works by artists De Scott Evans, Martin Johnson Heade, Joseph Biays Ord, William Sidney Mount and Raphaelle Peale to trompe l’oeil masterworks by John Haberle, William Michael Harnett and George Cope. Two paintings by John-Baptiste-Siméon Chardin and Abraham Mignon demonstrate the European examples frequently emulated by American artists first experimenting with still life in the early 1800s. The presentation at the High will be supplemented with four additional paintings drawn from the museum’s extensive holdings in American art, including works by William Mason Brown, Joseph Decker and John Frederick Peto. The partners have collaborated to produce a small catalogue for each installation in the series. The illustrated book for American Encounters: The Simple Pleasures of Still Life will feature an essay by Heydt that charts the rise of the still-life tradition in the 19th century and infusion of American symbolism into a traditionally European genre. The book will be published by the High Museum of Art, produced by Marquand Books, and distributed by the University of Washington Press. A lecture on the exhibition by Stephanie Heydt will be held at the Louvre auditorium on Wednesday, Feb. 4 at 12:30 p.m. Launching the collaboration between the Musée du Louvre, the High Museum of Art, Crystal Bridges Museum of American Art, and the Terra Foundation for American Art was the installation American Encounters: Thomas Cole and the Narrative Landscape, which explored the emergence of American landscape painting through the works of Thomas Cole and Asher B. Durand. American Encounters: Genre Painting and Everyday Life followed with an in-depth examination of five major genre paintings, each of which offered a unique perspective on 19th-century America and exemplified the European influence on American genre painting. The third installation, entitled American Encounters: Anglo-American Portraiture in an Era of Revolution, brought together paintings from all four institutions, as well as Versailles, to examine the evolution of late 18th- and early 19th-century portraiture in a time of strained political relations—but strong artistic influence—between Great Britain and the U.S. In 2003, the Terra Foundation supported a major conference on American art at the Louvre, entitled “The Independence of American Art.” The Louvre and the Terra Foundation collaborated again in 2006 on two important projects: the first American art exhibition at the Louvre, in which Samuel F. B. Morse’s monumental Gallery of the Louvre (1831–33), from the foundation’s collection, hung in the Louvre’s Salon Carré, the same room featured in the painting; and the Lafayette database, created with the Henry Luce Foundation, which is a comprehensive inventory of works of American art in French collections (http://musee.louvre.fr/bases/lafayette/?lng=1). From 2006 to 2009, the Louvre and the High participated in a collection-sharing initiative called “Louvre Atlanta” that included a series of thematic exhibitions and the development of joint publications and other collaborative scholarship. The Terra Foundation also lent its Gallery of the Louvre as part of the Louvre-High collaboration; the painting was on view at the High as part of the Kings as Collectors exhibition in 2006. Crystal Bridges Museum of American Art explores the unfolding story of America through a collection of works that illuminate American heritage and artistic possibilities. Founded in 2005 by the Walton Family Foundation, the Museum opened on November 11, 2011. The Museum takes its name from a nearby natural spring and the bridge construction incorporated in the building design by architect Moshe Safdie. A series of pavilions nestled around two spring-fed ponds house collection and exhibition galleries; meeting and classroom spaces; and a large, glass-enclosed gathering hall. The Museum’s goal of intersecting art and nature is realized not only in the physical buildings, but through sculpture and walking trails, which link the Museum’s 120-acre park and gardens to downtown Bentonville, AR. The Museum’s permanent collection spans five centuries of American paintings, sculpture, and works on paper ranging from the Colonial era to the current day. For more information, visit www.crystalbridges.org. The High is the leading art museum in the Southeastern U.S. With more than 14,000 works of art in its permanent collection, the High Museum of Art has an extensive anthology of 19th- and 20th-century American and decorative art, significant holdings of European paintings, a growing collection of African-American art, and burgeoning collections of modern and contemporary art, photography, folk art, and African art. The High is also dedicated to supporting and collecting works by Southern artists. For more information about the High, visit high.org. Heir to the century of the Enlightenment and the French Revolution, the Louvre was founded in 1793 as a museum for all, celebrating humanity’s long journey with the remarkable scope of a collection that spans thousands of years. Located in central Paris, and once a home to kings, the Louvre is now an internationally recognized cultural icon that strives to uphold a dynamic and ambitious policy of research, exhibitions, education, and acquisition. The world’s most visited museum, the Louvre further highlights its universal reach via the diversity of its 9 million annual visitors and additional 2.5 million viewers of exhibitions organized by the Louvre around the world. The museum presents 38,000 works of art in over 72,700 square meters of exhibition space. The permanent collection consists of Western art from the Middle Ages to 1848 and the works of ancient civilizations that preceded and influenced it (Egyptian, Greek, Etruscan, and Roman Antiquities; Near-Eastern Art; Islamic Art). For more information, visit www.louvre.fr.